Sauvignon Blanc has always been known for its “grassy” character, but never quite like this! Sonoma County is a land of eccentrics who play by their own rules. Now, Rebel Coast Winery has taken that to the next level: They’ve just announced the launch of the first-ever alcohol-free, cannabis-infused wine. That’s not a typo. Californians (and others) will soon be able to get their mitts on a premium Sauvignon Blanc which, through a patent-pending process, has been stripped of its alcohol and fortified with an active extract of Le Chronique.. No hangovers! But you might find yourself jonesing for artisanal goat cheese. Rebel Coast’s makes this fascinating brew the old-fashioned way from Sonoma fruit. Then the alcohol is removed and replaced with 16 milligrams of organic tetrahydrocannabinol (THC), the active ingredient found in cannabis responsible for a euphoric high. The infusion incorporates cannabis terpenes, imbuing the wine with a distinctly weed-tastic aromatic profile. 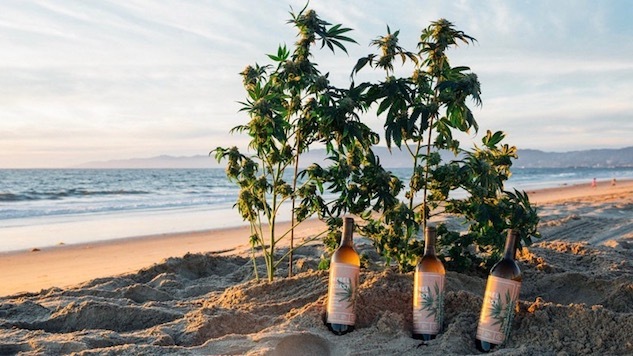 In the coming year, Rebel Coast plans to craft and release a refreshing cannabis-infused rosé and a sparkling wine, as well as a line of Cannabidiol-infused (CBD) wines with medicinal benefits, but no psychotropic effects, in the second half of 2018. Rebel Coast will offer the wine in additional states with recreational cannabis allowances and throughout Canada in the coming months. Rebel Coast is available to pre-order now (21 and over, please) and set to begin shipping to dispensaries and residents throughout California in 2018 in compliance with the state’s new cannabis industry regulations. The patent-pending product has four milligrams of THC per serving and on average affects consumers in under 15 minutes. (Your metabolic mileage may vary.) Orders are expected to ship early 2018 and are planned to be distributed to more than 500 dispensaries across California. Yes, but how does it taste? I intend to find out. Stay tuned.